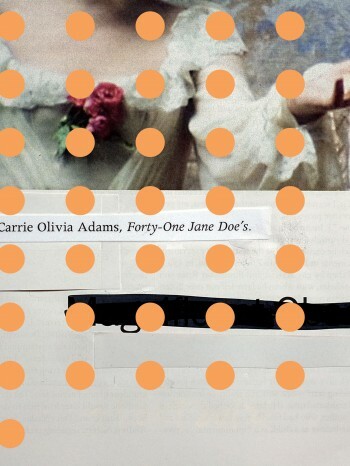 Carrie Olivia Adams’s collection Forty-One Jane Doe’s is less obsessed with uncovering the mystery of life as it is with uncovering the mystery of the mystery of life. In this volume of poems, philosophy, math, weather, enigmatic drink names, and antiquated science experiments are used for inspiration and inquiry, not toward discovery, but toward uncovering the mysteries these soft and hard sciences provide. This mystery is recognized, yearned after, but never solved by the volume’s speakers. Adams’s insistence on letting these mysteries remain just that, however compelled her speakers are to solve it, makes this volume at once celebratory of, and haunted by, simply being. It is desire for the reason that never comes which gives this volume its energy, like in the beginning of the section Intermission With the Scientist, a poem about the experiments of a sixteenth-century scientist’s quandary. Adams writes, “I have with the aid of a magnifying glass / both seen the heart pulsating myself / and shown it / to many others.” We are fooled, for a moment, into thinking this is a human heart. This image is mimetic of Adams’s speaker’s simultaneous movements toward exposure and concealment. We don’t learn that the heart is a pigeon’s heart until the final stanza, and yet we learn much from the speaker’s desire to expose the heart “to others,” as if her puzzle can be solved by seeing another’s astonishment. Later in that same section, a sensuality, which pervades the volume as a whole, comes into the experiment as a catalyst. The scientist wets his finger and touches the pigeon’s heart. “Both ventricles and auricles pulsated” in reaction—a momentary resurrection—to which Adams gives no qualitative explanation. She leaves the cause to the imagination, asking of readers a willingness to be touched without explanation. The roundness of the Janes’ perspective in this section is emblematic of Adams’s wry humor throughout the volume. The Janes, like all of the speakers in this volume, regard their surroundings with an uncompromising wonder that demands the anonymity to observe and the agency to engage the world as they please. This sense of wonder is also captured in the three short films made in tandem with the poems. The films juxtapose the text of the poems, through subtitles and aural performances of the poems, with the richness of city streets and seaside caverns. It was in the middle of the titular film where I found what captivates me most about this collection. The sound in this film contradicts the ease of the photography, juxtaposing the harsher sounds of the city—automotive screeches, tinning bells, clacking doors—against images of teenagers talking, children playing in a tunnel, and friends smoking outside a bar. The harsh sounds, coupled with tense quotations from the text displayed between footage, reminds that to find beauty, even when merely spectating, one must make oneself vulnerable to what is being spectated. This film, like the book, asks us, demands us, to be present as Adams takes us to the depths of presence. Though the equation is always obscured, though the surroundings may be harsh, Adams takes our hands as we walk open.